Today we hand over the blog to Naomi from newest stockist Olivia Hooper Bridal Studio in Wedmore Somerset. 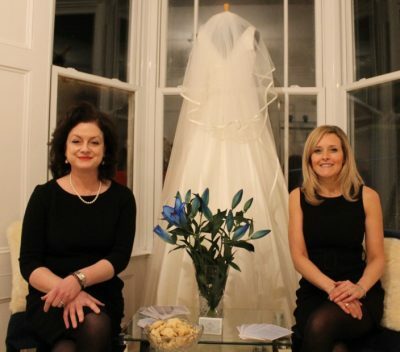 Although Naomi and Sarah have just opened their own boutique they are no strangers to the world of bridal design. I have been instructed by more than one. Having not read too many blogs I was at a loss to know what to write or what to say? Another thing occurred to me, why did I have to do it? Could it be the fact that I’ve been in the bridal world for 25 years? I have dressed brides from all corners of the globe, but mostly Somerset brides, Devon brides, Bath brides and over the last ten years predominantly Bristol and Clifton brides. Or, maybe because I spent a chapter of my career designing and making bridal gowns? It could be because I have had the honour of working with some of the most eminent bridal gown designers in the industry? Possibly because I have a keen eye, not just on cuts, fabrics and figures, but on the funny side of life, of which there is a plenty in our bonkers bubble of brides? I’ll figure that one later. I then pondered on those who had pointed the figure in my direction next. The first, one of the best designers walking the catwalk, I have known her for nearly twenty years and have tremendous respect for her skills, character and knowledge of her craft. Another, my business partner, someone else I have a vat of respect for. Sarah has proven to be the complete package in the bonkers bubble and why I wisely placed my confidence in her abilities to do what we are doing. Anyway, the net result is, still none the wiser, but after 25 years of silks, satins and fittings, let’s have a go at blogging. If there had been a book on how to open a bridal shop, Sarah and I would have surely purchased it at the beginning. However as we have made the ‘journey’ we have not had that many hitches. Our collective experience of thirty five years armed us with lots of points of reference and direction. We collated our mood board with ease, even with telepathic crossed email paths of suggestions. The vibe of chic, clear, chrome and crystal fell easily into fruition with a cohesive white colour way and a splash of blue to sharpen the look. The choice of designers was a given, two of the most prestigious and award winning greats of British Bridal design. Alan Hannah and Suzanne Neville. Both designers have their work rooms based in England, ensuring accurate delivery times and sublime craftsmanship, practiced for twenty or more years a piece.The logistical process of painting, carpeting, fitting out proved no more challenging than doing a domestic refurb, other than opting for a bleachable carpet. If I were honest the hardest bit of all this was trying to figure the name. It is such an emotive part of all this, it sets the tone, the imagery, the emotional connection to the enterprise. “Olivia Hooper” has been born from the feminine influences of both Sarah and myself.